The Flexi New Comfort Leash is a stylish dog lead that allows you to remain in control of your dog whilst simultaneously giving them the ability to roam with a little more freedom. The soft grip keeps your hand comfortable during long walks and a secure snap hook attaches the lead to your dog’s collar or harness. 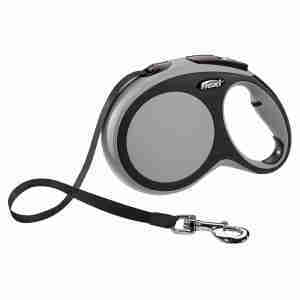 Lead tangling is reduced as the tape automatically rolls back into the lead as you get closer to your dog. Flexi New Comfort dog leads feature a ‘short stroke braking system’. This means that the brake can be pressed to lock the length of the lead temporarily. Handy if your dog suddenly notices a cat! You can ensure you never forget dog poop bags, treats or a light during evening walks with the Flexi Multibox and Flexi Light. Both of these handy items attach to your New Comfort lead.